From some John McCarthy lecture slides on extensions to logic for common sense. Find the height of a building using a barometer. Multiply the difference in pressures by the ratio of densities of mercury and air. Drop the barometer from the top of the building and measure the time before it hits the ground. Measure the height and length of the shadow of the barometer and the shadow of the building. Rappel down the building with the barometer as a yardstick. Lower the barometer on a string till it reaches the ground and measure the string. 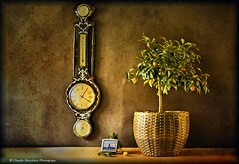 Sit on the barometer and multiply the stories by ten feet. Sell the barometer and buy a GPS.